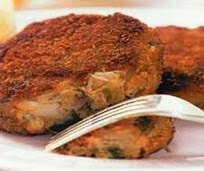 We know when we have a winner and we have one with our specially prepared Crab Cakes. Working with an elite seafood manufacturer, we have collaborated on a recipe that harkens to the flavors of the Pacific Northwest. The ingredients are all of the things you would chose if you were making them in your own kitchen including... crab meat, bread crumbs and eggs. The ease of use, especially during the holiday season, makes these an enormous time saver. The cakes are 3 oz. each and come layered in a 9# case (that translates to 48 cakes to a case). The price per cake comes in well under $1.70/each making them very affordable too. Give this popular item a try and you will save money, time and have happy customers.